This card is made using another image from this Sunday's release at Digistamps4joy called "Bird House"
My card for today - "Home is where the heart is"
The sentiment is k & company stickers. The wire flourish is using purple cow's wind it wire. This is beautiful Pam - I just love all of the delicate little details. 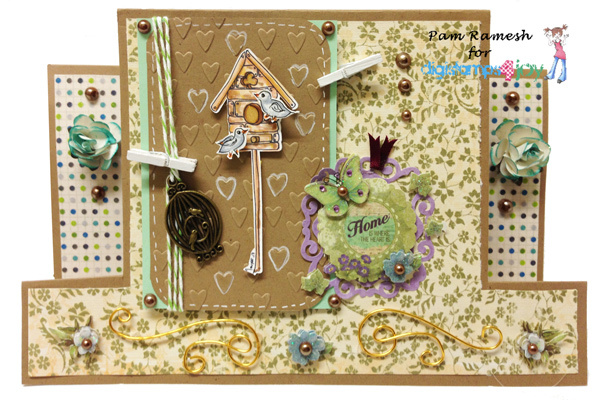 Pam this is a beautiful centre step card and the little pegs is a nice touch. Beautiful card! Thank you for playing along with my Flutter By Wednesday Challenge! Wonderful card, the papers are so pretty. Thank you for joining us at SCH this week.